Sorry for the short notice. Hope to see others tomorow, 4/10 @ 12:30. Last edited by ChgoMike on April 9th, 2008, 9:24 am, edited 1 time in total. And, of course, I'm in! Thanks, ChgoMike, for organizing this. I haven't been to JK Sweets since I was a college student. I'll be there tomorrow. I will try to be there also! I had to reschedule some students and I have to fight the edens--I don't think I'll be able to make it today Have fun! But today's was interesting. I'd been past JK Sweets many times. I noticed the display case of cakes and other pastries. I knew they served ice cream and frozen yogurt. 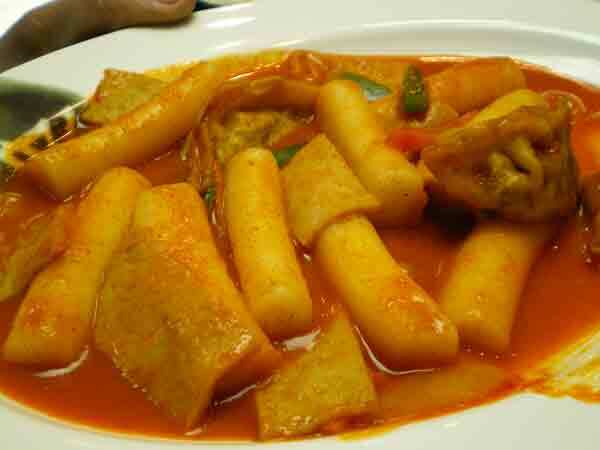 What I didn't know, until pointed out by ChgoMike and MHays, is that JK Sweets is also a Korean restaurant. How many people would have guessed that from the name? Hands? Overall, my impression was the food was creditable, although the dishes labeled "spicy" were relatively mild; otherwise pretty good. 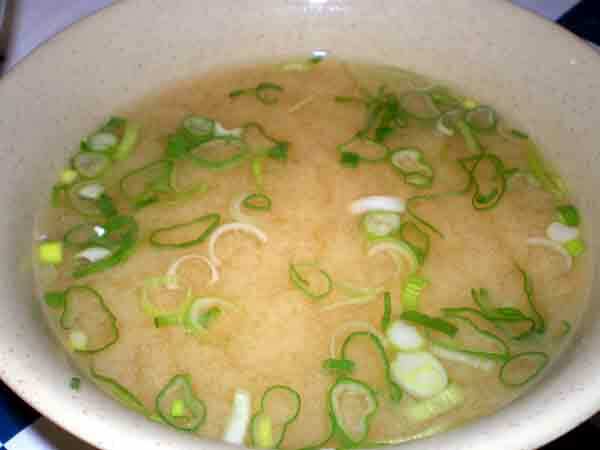 Many of us started with the miso soup, chock full of green onions. 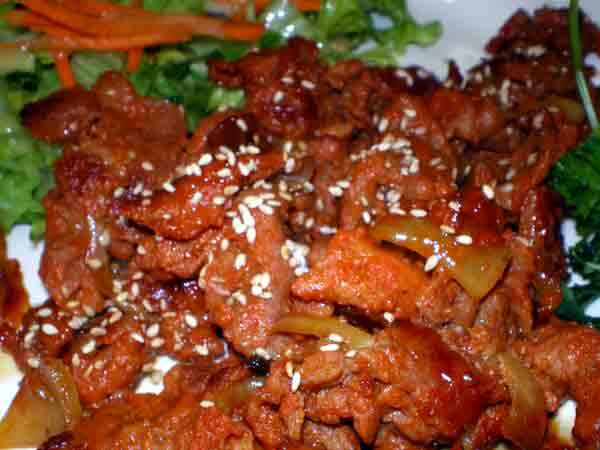 As mentioned above, the Spicy Pork Bulgogi wasn't especially spicy, but it was still tasty. 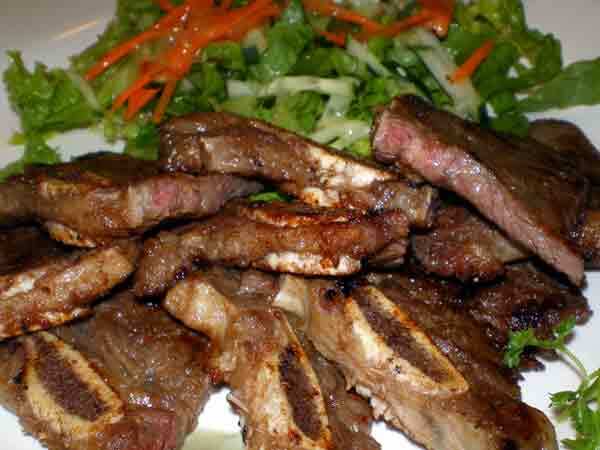 The Kalbi was maybe a bit chewier than I'd like, but was otherwise fine. The Bi Bim Bop was fine, but not revelatory. Spicy Chicken also wasn't very spicy. It was about 70% - 80% as good as the chicken last night at Honey 1. The Duk Bog Gi (not sure of spelling) was a dish I'd never had before - rolls of unleavened rice dough in a flavorful sauce. Reminded me very vaguely of a roll of gnocchi. If I were in the neighborhood (part of the Northwestern campus is virtually across the street) it could be a nice lunch option. But clearly not a destination. Thanks to ChgoMike for organizing a fun afternoon. Thanks again, Mike - it's fun to eat here because of the history I have with JK's...which apparently many of us share. The menu is much more extensive than I remember it being when I used to go before I was a Mom...so about 8 years ago was the last time I'd eaten here. IIRC, the menu had Bi beem bob, Udon, California rolls, and and one or two other dishes. I didn't pay any attention at all to the American menu, but it looks to have increased as well. I would say that I liked this version of Bi Beem Bap better than the one at the Evanston Grill. Yes - not a destination, but I'll probably stop by again sometime in the near future when we're downtown at lunchtime. Agreed. I wish the "spicy" actually meant spicy, but it was nonetheless tasty. I should be more specific, here, since it goes a bit further in the non-spicy direction than one would expect - the spice levels were such that Sparky would eat it - he whose tolerance of capsaicin is equivalent to McCarthy's tolerance of Communism. Not to say the food was without flavor - just that the heat was notably, and almost completely, absent. 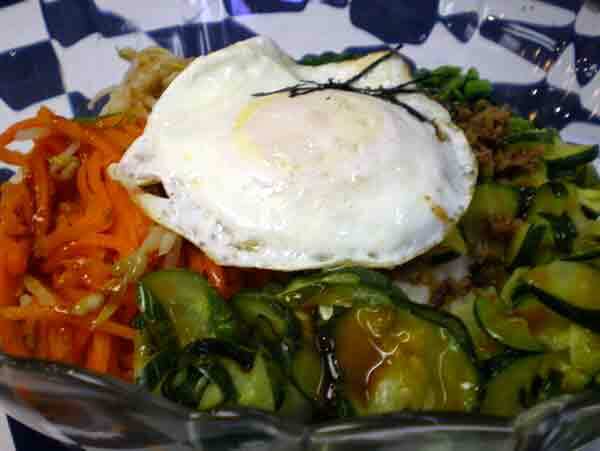 nr706 wrote: The Bi Bim Bop was fine, but not revelatory. While on the topic of Evanston Bi Bim Bop: Laugh if you want, but I like the Bi Bim Bop at the Blind Faith Cafe a few blocks down the street on Dempster. In fact, I like it so much that every time we're there, even though I resolve to try something else, I only order that. (It's like me and the 49er flapjacks at Walker Bros.) The seitan in it is really, really tasty. 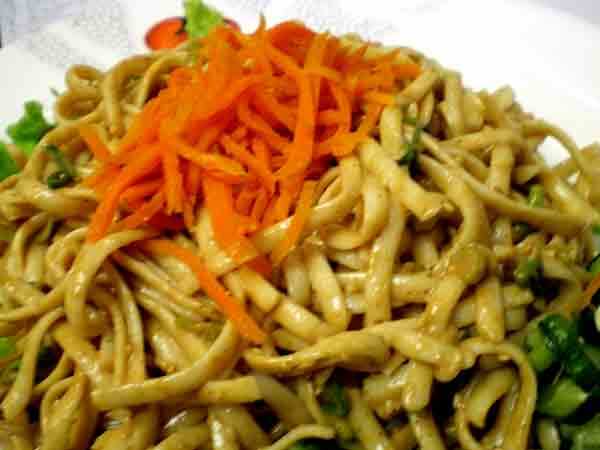 The dish may even be fairly authentic; if it isn't, you couldn't prove it by me. And the red sauce they serve on the side makes it, well, not as hot as some of you might wish, but pretty hot. IIRC, even this was less spicy than I'm used to - (meaning, perfect for me) I didn't have much, and it was in a house squeeze bottle, so I don't know what brand they used. Keep in mind, I generally don't like spicy foods, and I'm not trying to imply I didn't like the lunch - put it this way, with all the chains in downtown Evanston, JK is a solid option. If you love Korean and your dining companion is an extreme spicy-phobe, JK would be a gentle intro - but I'd arm myself with some Siracha. I missed the spiciness, too, (I doused the bi bim bop I ate at H Mart the night before the JK Sweets lunch with gochujang), but I would happily eat the chicken or the entree of rice cakes and dumplings again for a weekday lunch. Mike, thanks for getting me back to JK Sweets. I concur with the previously mentioned assessment of "tasty," as I thought all of the dishes we chose at JK Sweets were definitely that. I've eaten bi bim bop a couple of times in the past couple of months at the Evanston Grill, and I'd have to agree with MHays that the version at JK Sweets (although it had less meat than the EG version) was just a shade better. I couldn't identify exactly why, though. Maybe the ingredients seemed a little fresher? 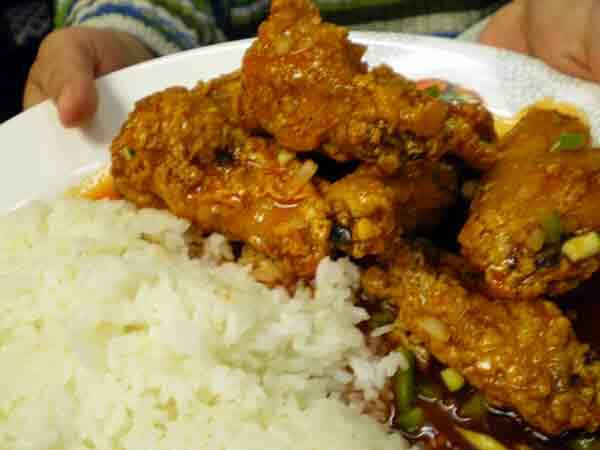 On the other hand, I remember the gochujang at the Evanston Grill (also served in a plastic squeeze bottle with no clue as to brand) as being much darker and having more of a bite to it. The stuff at JK Sweets was the color and consistency of ketchup--and not much spicier! All in all, the company and the food certainly made for a bright spot in an otherwise incredibly dreary day! Thanks, Mike, for suggesting this. Let us add our thanks as well, Mike! This was a great idea for a rainy Thursday. We are certainly not spice averse, but we agree that the food was tasty. And who can complain about the price? For the money, it is a very good option for a quick lunch.